NFL finds New England Patriots played with underinflated balls. A softy? 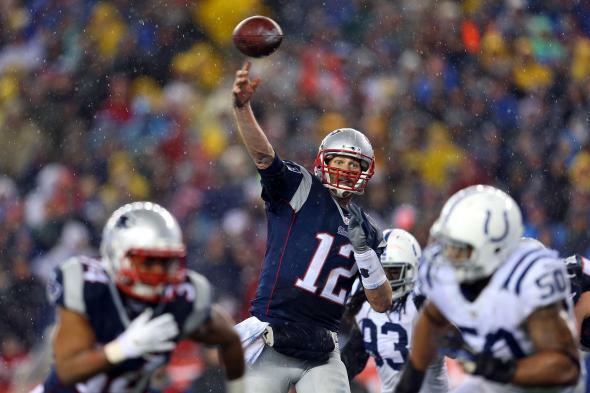 Tom Brady throws a touchdown pass. “This is not ’Nam … there are rules.” When Walter Sobchak uttered those words, he was referring to bowling, but we can assume he would not be happy with the New England Patriots right now. NFL has found that 11 of the Patriots footballs used in Sunday’s AFC title game were under-inflated by 2 lbs each, per league sources. The problem, of course, is if the Patriots intentionally released air from the game balls during their 45–7 demolition of the Indianapolis Colts on Sunday. “We are not commenting at this time,” Greg Aiello, the NFL’s senior vice president of communications, told ESPN. Almost immediately after the game came murmurs that the NFL was looking into whether the Pats had let some of the air out of the balls that Tom Brady used during the game. Softer balls are easier to grip when the conditions are wet, potentially giving the team that uses them an advantage.